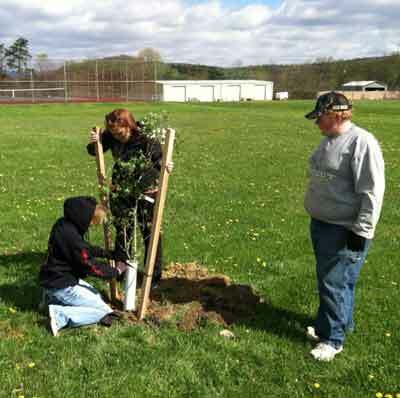 Petersburg High School was awarded 24 flowering trees through WV Project CommuniTree to plant on their campus in Grant County, WV. Eleven volunteers participated in the planting day, which occurred on Earth Day April 20th 2013. A group of eleven teachers, administrators, and students worked through the morning from 8:00am until 10:30am to plant the 24 trees along a walkway. 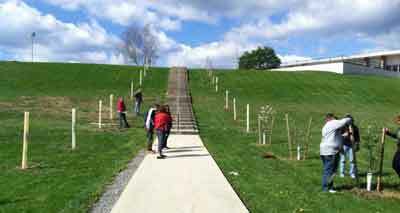 The planting area lines the stairway between Petersburg High School and South Branch Vocational and Technical center. 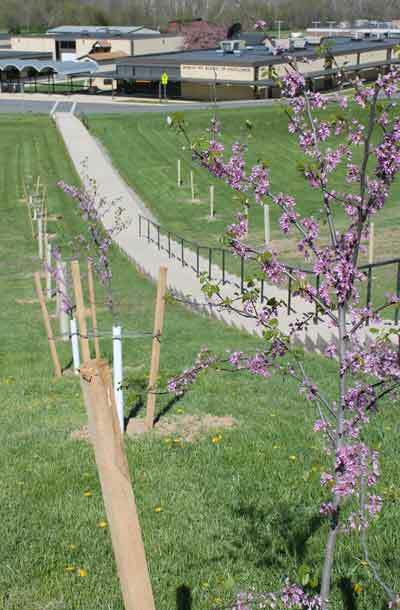 Tree species planted were a mix of Serviceberry, Eastern Redbud, and Flowering Dogwood. The holes were hand-dug prior to the planting by three students, six teachers, and the principal and vice-principal. The 8th grade students watered the trees throughout the spring and applied mulch the school day following the tree planting event. The project leader was aided throughout the process by CTree Liaison Melissa Merritt of the Potomac Valley Conservation District.